Newtownstewart Golf Club was founded in 1914 is 5,901 yards long a Par 70 with a standard scratch of 68 off the white tees. Nestling on the foot of Bessy Bell Mountain, in the rolling parkland of Baronscout, the ancestral estate of the Duke of Abercorn. The course is festooned with beech trees and wild life. The golfers will frequently encounter wild pheasants, red squirrels and buzzards during their round. The course offers magnificent views of the Sperrin Mountains all contributing to an enjoyable and memorable days golf. 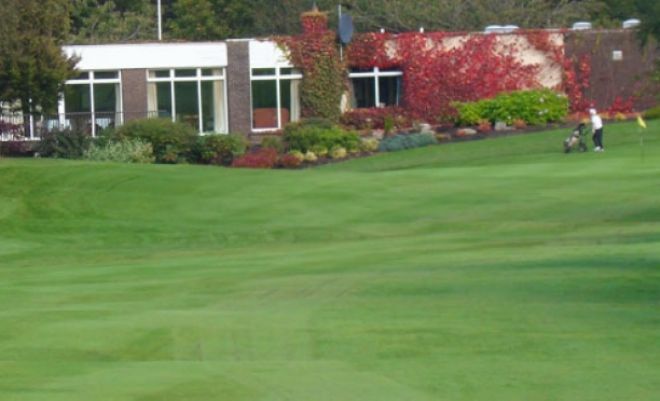 Newtownstewart Golf Club is frequently used for GUI events and has staged many a successful Pro-Am Tournament. Frequently described as a demanding test of golf off the back tees, Newtownstewart hosts a good number of open competitions during the year where the visitor is extended a warm welcome and the emphasis being on friendliness rather than formality. The inaugural meeting of the club was held in the Abercorn Hotel, on 9th October 1914. The Duke of Abercorn was thanked for his generosity towards the club and he was elected President. Two other men are credited with the foundation of the club. They were Mr. H. Kiernan, of the Northern Bank, and Mr. W. Ross who was elected Captain in 1922. 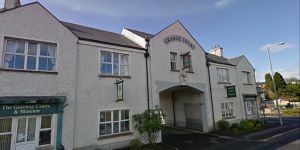 Newtownstewart was initially a nine-hole course, ten minutes' cycling distance from the town. The club extended to eighteen holes in 1970. Newtownstewart Golf Club was first opened as a 9 hole course on the 23th of October 1914 and continued with a small membership (mainly car owners) until the war years (1939-45) when it practically closed down. Some play did continue however, particularly by members of the US army who were stationed nearby in Newtownstewart. They actually put in the first drainage system. It consisted of empty petrol drums joined together along a narrow trench. In the sixties membership began to increase significantly (In 1957 it was 88 today it is 476.) 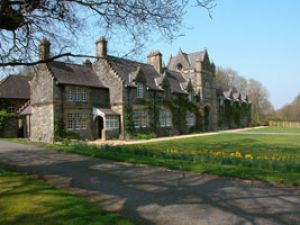 so an approach was made to the Baronscourt Estate about the possibility of acquiring extra land. Their first offer was of approximately 15 acres on the other side of the entrance road. When it was pointed out that this was somewhat small for what the club had in mind the estate agreed to allow the club to have about 40 acres across the ravine to the South. A bridge was built across this ravine by voluntary labour in 1967, a well-known course architect, J.J.F. Pennink from the firm of Cotton, Harris and Pennink, was commissioned and the course extended to 18 holes. In concluding his recommendation for the extension Pennink added, "I very much enjoyed my visit and was enchanted by the beautiful terrain." Not a bad commendation from someone who had seen it all. Finally the first offer of 15 acres was also acquired and opened as a practice area in 1974. Because of the nature of the underlying soil, many parts of the course had always suffered from poor drainage. Over recent years however an extensive drainage scheme has been undertaken, mainly under the guidance of the then Greens Convener, Jimmy Kelly and a new Head Greenkeeper, David Irvine. The necessary equipment to maintain the system was also purchased and the whole scheme has really revitalised the course. A new Greens Convener, James McCrory, has continued with these improvements and the course is now looking better than ever. 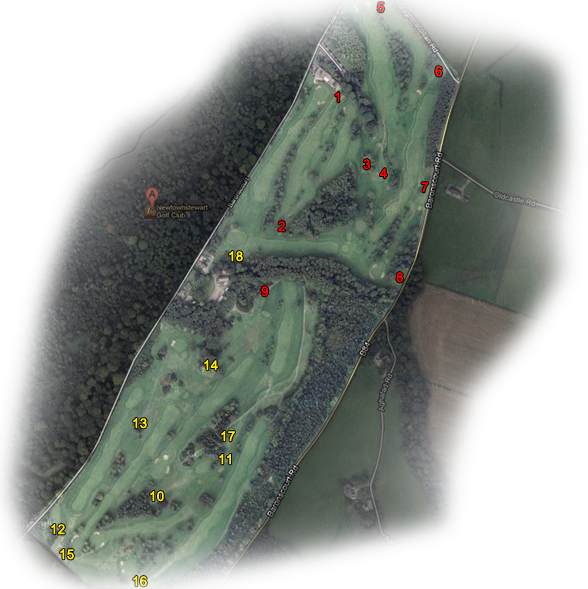 Newtownstewart course now consists of 18 holes, made up of 5 par 3's, 3 par 5's with the rest being par 4's. With a par of 70 and Standard Scratch of 69 it measures 5320 yards and has a convenient practice putting green and an extensive practice. Sneaky little devil, Polts. Thought he was just a terrible golfer?But he has laid a lawn front and back of his new bungalow, entirely out of divots".